Memory specialist G.Skill has announced a range of all-new memory kits specifically supporting modern AMD platforms. 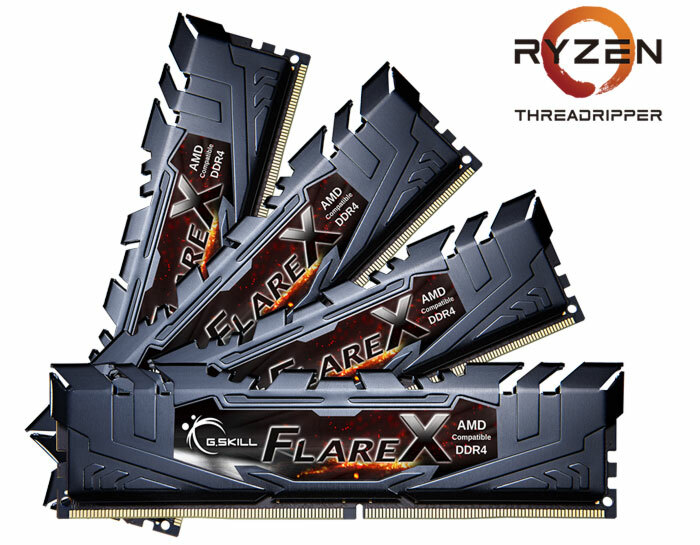 The G.Skill Flare X series DDR4 memory kits are noted to be compatible with the new Ryzen Threadripper processors and AMD X399 chipset motherboards, and mark a return of the Flare sub-brand which provided great performance for the previous DDR generation. G.Skill says that the new AMD architecture requires "a completely different set of memory enhancements, requiring a new approach," and of course it has addressed those needs with its Flare X DDR4 RAM. It has kits targeting the greatest frequencies possible, the DDR4-3600MHz 32GB (8GBx4), as well as a massive total capacity at DDR4-2933MHz 128GB (16GBx8). Two other kits have been put together sitting between these extremes, hopefully addressing your RAM soft spot (or budget), see below. All of the Flare X memory kits launched by G.Skill today are quad-channel offerings. The highest capacity kit uses all eight DIMM slots on an AMD X399 motherboard, but the rest use just four. As usual, G.Skill has carefully selected the modules within its kits for maximum stability at the claimed frequencies. In an email to HEXUS G.Skill said that all the new Flare X memory kit modules are "built with Samsung B-die chips". 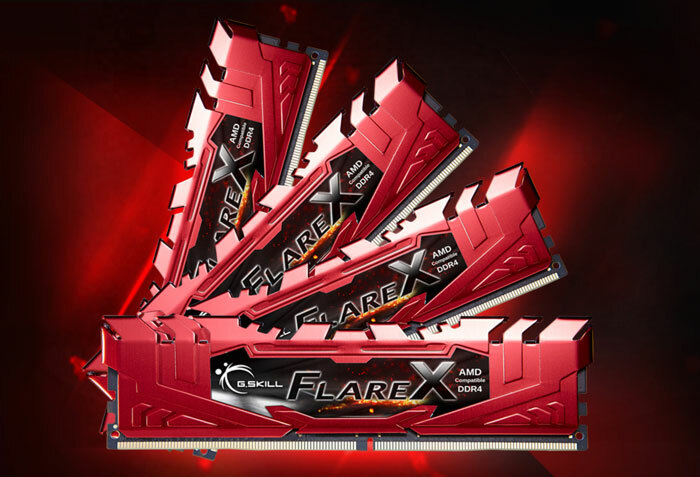 G.Skill is producing the new Flare X series DDR4 RAM with a choice of red or black heatspreaders. Buyers get a lifetime warranty. We haven't been provided with availability and pricing information. Probably but Ryzen does prefer certain memory modules more than others,so if G.Skill ensures it has modules which can run at the rated speed on AMD systems,it will help a lot with compatibility. OTH,if they just whacked an AMD badge on their normal sets,then yeah pretty much just marketing. My TridentZ RGB set of RAM work just fine with Ryzen 7. RGB control works great and they run at their full 3000MHz speed no problem. Using some viper elite 16GB 3000 Oc'ed to 3333. For 109 GBP cheapest around. Patriot has a list of the Ryzen Mobos they have tested their ram with in a pdf list. I simply bought one of them, job done. No need to pay through the nose.